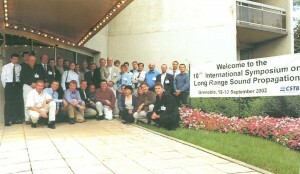 The International Symposia on Long Range Sound Propagation are held every two years alternately between the US and Europe. The goals of the symposia are to exchange information on current research in sound propagation in the atmosphere ranging from infrasound to low frequency audible sound. Presentations on all aspects of long range sound propagation are welcome including wave propagation, source modeling, signal detection and analysis and instrumentation. Focuses have included meteorological effects on signal propagation, acoustics for atmospheric sounding, and acoustic monitoring of man-made and natural hazards. The 16th Symposium on Long Range Sound Propagation was conducted at the University of Mississippi on 20-21 September 2016. Electronic versions of the proceedings can be downloaded below. For older proceedings please contact our office at 662-915-5889 or by email ncpawork@olemiss.edu.